As Philae just woke up, we examine one exciting question of the Rosetta mission: what is the origin of water on Earth? A hypothesis proposes that comets brought to our planet this molecule central to life. The Rosetta mission is an ambitious scientific program launched by the European Space Agency to analyze the water on the comet 67P and trace the link between terrestrial and cosmic water. In November 2014, Philae, the lander component of the European Space Agency (ESA) spacecraft Rosetta, made headlines worldwide by accomplishing the first soft landing on a comet surface (Figure 1). 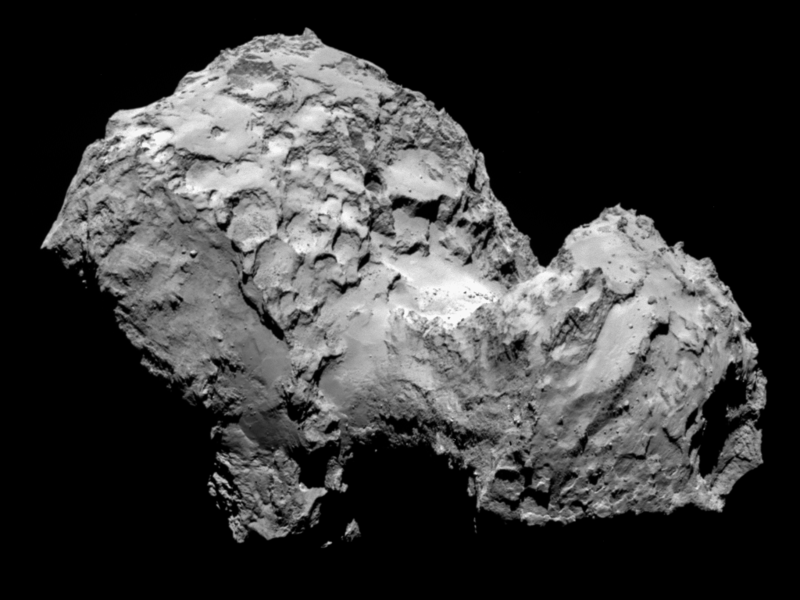 Its destination was the comet 67P/Churyumov-Gerasimenko, named after its Ukrainian discoverers . Since its orbital insertion in August 2014, Rosetta has been sending high resolution pictures of the comet back to Earth. However, there is more to its science than pretty pictures of the comet. For instance, the mission aims to reveal signatures of complex organic molecules on the comet and the origin of the water on Earth. Let us review the latter in detail, which is fundamental to understanding the origin of life itself. First of all, you may be wondering what exactly a comet is. Although the Sun and the planets are the only objects that meet the eye at first sight, the Solar System is in fact a rich collection of astrophysical objects including microscopic particles known as dust, asteroids, and comets. A comet is a body smaller than a few tens of kilometers, made of dust along with significant reservoirs of ice. A common feature of comets is a long, nebulous tail of ice and dust particles, which results from the interaction of the ice in the comet and the charged particles from the approaching Sun. This phenomenon is usually visible from the Earth and has historically been recorded by many civilizations in the past. The main motivation for studying comets is to learn about the evolution of the Solar System and possibly its early stages. The Solar System is thought to have been formed by the collapse of a cloud of gas and dust about 4.5 billion years ago. The rocky planets of today were subsequently formed by the hierarchical coalescence of dust due to gravity. Therefore, the planet Earth would have had to be extremely hot after this coalescence for any significant amount of volatile water to be maintained. It is therefore unlikely that water was left on Earth in this way. So, where do the oceans on our planet come from? A leading hypothesis is that it came from comets, which can hold large reservoirs of water. It is currently thought that most comets are pristine leftovers from the formation of the Solar System . In other words, comets, unlike planets, do not melt during their formation. This melting causes the densest elements to sink into the center and therefore changes the chemical makeup of the body. Since comets are old and contain significant reservoirs of ice, it is plausible that comets may be responsible for bringing water to Earth through an extended episode of comet bombardment. Therefore, a better understanding of comets is a major step towards understanding of our own origins. For that purpose, the Rosetta spacecraft is equipped with a wide variety of instruments. Among them, the mass spectrometer provided important results, which were published in Science on January, 23rd, 2015 . A mass spectrometer can identify the chemical composition of a sample by measuring the both the electrical charge and the mass of particles included in the sample. This is accomplished by sending charged particles from the sample through an electric or magnetic field and measuring how they travel through the field—for example, more positively charged particles would travel closer to the negative side of the field (Figure 2). This paper used mass spectrometry to show that the water vapor in the atmosphere of the comet was roughly three times heavier than the water found on Earth. In a mass spectrometer, heavy water molecules, in which the Hydrogen atom is replaced by the heavier Deuteron, move differently through a magnetic field than normal water. So while water on Earth and on the comet both have a mix of Hydrogen and Deuteron water molecules, the comet water has more of the “heavy” water molecules. The abundance of such “heavy” water is a characteristic of a water sample and cannot be modified after its formation. Therefore, finding seems to imply that the water on Earth cannot have been originated from comets – or, at least from comets similar to 67P in structure or orbital characteristics. Figure 2: A. Mass spectrometry can tell apart heavy and normal water. B/C. Water in 67P has a higher heavy water abundance compared to that in the Earth. The D/H ratio refers to the amount of Deuteron compared to Hydrogen. Since shortly after its landing on the comet, Philae had been out of battery. However the comet is currently approaching its perihelion, where it will come closest to the Sun during its highly elliptical orbit. As the comet gets illuminated more strongly, it has been conjectured that Philae’s solar-powered rechargeable battery may awaken the lander in the coming months. This would be especially interesting given that the comet will become more active close to its perihelion, with jets and outbursts of gas and dust triggered by the increased surface temperature. Scientists have been listening for a signal from the lander since March 2015. Fortunately on June 13th, 2015 the lander became operational again and signaled its first data back to Earth since last November . Further operations on the comet are very important for interpreting the above results, since repeated measurements of the abundance of heavy water on the comet surface may help reduce experimental uncertainties . So stay tuned for more news – it may not be over yet! Tansu Daylan is a second year graduate student in the Physics Department at Harvard University. He works in particle astrophysics and studies possible astrophysical signatures of dark matter.